Situated at 289 Hudson Street in New York City, the Half Note Cafe quickly established itself as the venue atwhich to catch some of the best up and coming jazz talents of the age. Its reputation was further enhanced with aseries of live recordings conducted at the club, with John Coltrane, Wes Montgomery and the Art Farmer Quartetamong those artists to subsequently release live albums.And then there was Donald Byrd, whose band comprised Donald (trumpet), Pepper Adams (saxophone), DukePearson (piano), Laymon Jackson (bass) and Lex Humphries (drums) and who gathered at the Half Note on11 November 1960 to record their show. With local DJ Ruth Mason acting as MC, the show kicked off with theten minute plus My Girl Shirl and closed some two hours later with When Sunny Gets Blue. When subsequentlyreleased on vinyl, the show had been mashed up somewhat, with the two albums showing no reference to theoriginal running order.That does not detract from what is an excellent album, with its later companion volume equally enthralling andentertaining. First class performances all round, as you would expect, make this a compelling album. As was noted on the first volume of At The Half Note Club, the running order of the show did not quite tally withthe subsequent vinyl releases that appeared on the Blue Note label in 1960. Quite why the original compilersopted to re-arrange the albums is lost in the mists of time, but thankfully the whole of the show was made availableover the two albums.What is revealed is one of the tightest bands Donald Byrd had ever assembled, including himself on trumpet,Pepper Adams (saxophone), Duke Pearson (piano), Laymon Jackson (bass) and Lex Humphries (drums). Particularlyworthy of special mention is Duke Pearson, who wrote four of the eventual twelve tracks that appearedacross the two albums. 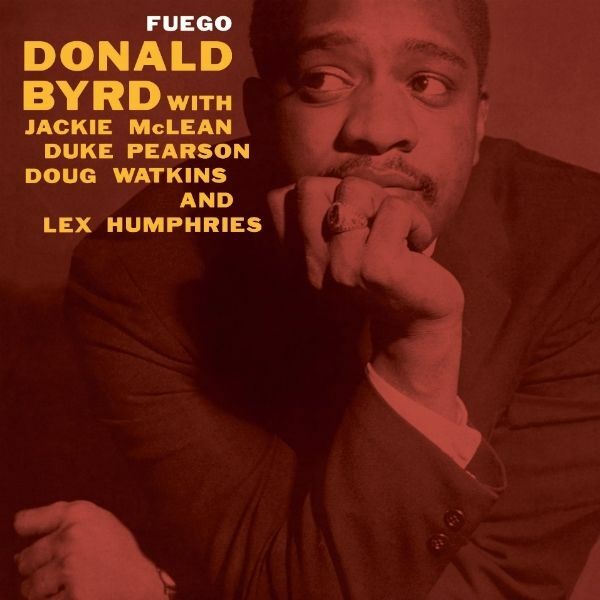 His playing too is little short of spectacular; it has been said that his soloing in the studiowas somewhat stilted by comparison with the work he achieved during live dates.Of course, it is the work of Donald Byrd that will be of particular interest, and here across all four tracks he trulyexcels. 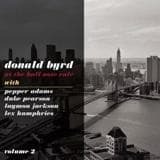 There are several live recordings of Donald Byrd available; this and its companion volume are undoubtedlythe best of the bunch. Recorded in 1959 at the legendary Van Gelder Studios in Hackensack, New Jersey, this is considered one of Donald Byrds finest LPs. The then 27 year old trumpeter had many LPs under his belt already, but this was his second on Blue Note, where he would stay for decades and release the best music of his career. 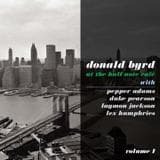 Byrd had a fruitful run in the late 50s with the great baritone saxophonist Pepper Adams and here they are joined by long-time Thelonious Monk Quartet tenor-man Charlie Rouse, and a great rhythm section. After a rousing take on Sinatras "Witchcraft" the record features 3 strong Byrd originals and 2 compositions from the groups pianist, Walter Davis, Jr. A hard bop classic from one of the strongest players of the era. 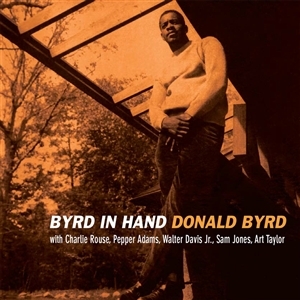 Byrd In Hand finds master trumpeter Donald Byrd working with a sextet, along with Charlie Rouse (tenor saxophone),Pepper Adams (baritone saxophone), Walter Davis Jr (piano), Sam Jones (bass) and Art Taylor (drums),working their way through repertoire that feature three Byrd originals, two songs by Davis and the standard Witchcraft.While the original material didnt catch on in the same fashion as many of his other compositions, then there isstill plenty to enjoy and admire, not least the growing maturity Donald is able to display on these outings. Addto this the distinctive two horn work of Rouse and Adams and this is a hard bop album that stands out from thecrowd. 180 gram LP. 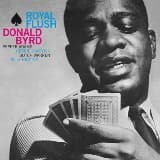 Originally released in 1961, Royal Flush was trumpeter Donald Byrds eighth album for Blue Note. During this period, Byrd-who was then perhaps the finest living hard bop trumpeter-had begun concentrating his efforts on a quintet formed with baritone sax player Pepper Adams. Featuring Butch Warren on bass and Billy Higgins on drums, the quintet was most notable however, for introducing a 21-year-old Herbie Hancock to the jazz world, in his first ever recorded session! The album also features Hancocks first recorded composition, "Requiem". Hancock's first session as leader would not appear until the following year with 1962s Takin Off.